Absolutely free. Is this real? The following mathematical proof has been designed so you trust this game. It proves that, when you click the 'Play' button, we display the true winning number and don't make it up. The winning number is included (encrypted) in the number 'a' as explained below. The number 'a' is displayed below. The numbers 'b' and 'c' will be displayed when you click the 'Play' button. The numbers 'b' and 'c' are prime numbers. Therefore, both of them are unique for any specific 'a'. The number 'b' is the lowest between 'b' and 'c'. Winning Number: the 2nd to 8th digits of the number 'b'. Ask a friend of yours who is good at mathematics. Ask in a forum about mathematics or prime numbers. Do your own research in Google. Look for 'prime numbers factorization'. 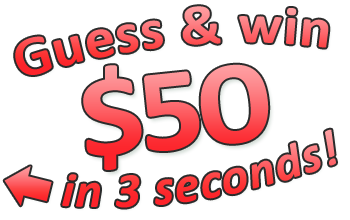 The odds of winning $5 are ten times higher than the odds of winning $50. Enter key to 'Play' or 'Try again'. Every time you open www.lotterish.com, a new winning number is randomly generated. Guess this winning number and you'll get $50. How many times can I play this game? You can play up to 50 times per day. Your guess: None. You haven't played before. The number 'a': None. You haven't played before. Why do you display my last draw? In the unlikely event that the server goes down after you click the button 'Play', you can always play again your last guess by clicking the button 'Play again'. Of course, your last guess will remain associated with the same number 'a' and the same prize amount. Your guess and the number 'a' are stored in a cookie in your own computer or device. If you want to view how these cookies are set, right-click on the page and select the option View source code. Can't you understand this explanation? Don't worry. You don't need to understand it to play this game. It only allows you to make sure this is a fair game. © Copyright 2019. Lotterish. All Rights Reserved.